Moving time: 5 hr 47 min. Wind: South wind all day long. It started out at 5 mph but grew to 20 mph by the end of the ride at 3:30pm. Weather: 75°F (24°C) in the morning; got up to 92°F (33°C) by the end of the ride at 3:30pm. Just like yesterday. I rode with Joe and Geert today. They are great guys and ride at a very nice pace. They don't push themselves as hard as I have been and I felt better at the end of the day because of it. This is the first day that I have ever ridden with anyone. Geert is a seasoned bicycle tourist and Joe is more skilled than I am. I'm not sure how long our trio will last. There was a lot of riding throught the middle of nowhere today. We did a 38 mile stretch with no services and the terrain was absolutely flat. Much of the riding was along back roads with very little traffic. 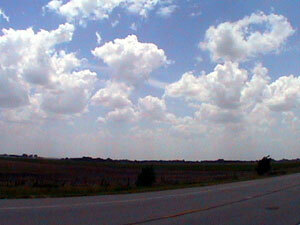 As we approached Hutchinson the traffic picked up and the trucks really buffeted us around. 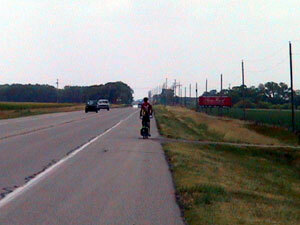 Sometimes it gets hairy when there is a 20 mile per hour cross wind and a big rig passes you doing 75 miles per hour. They are appreciated since they usually give a nice tug with wind they push in front of them and the slipstream they drag behind. Geert broke a spoke about 30 miles into the day. It is his second broken spoke this trip. Both were right rear spokes which requires the removal of the cassette. There's a one in four chance that a broken spoke will be one of these. So far Geert is batting 1000. We rigged up one of my Kevlar temporary spokes and Joe and Geert trued the wheel as best they could at a convenience store. When we got to Hutchinson Geert got a replacement spoke and had his wheel trued at Harley's bike shop. It's a good thing that it happened now since the next bike shop is not until Pueblo, Colorado - over 400 miles from here. Here is a picture of the master mechanics at work at the Conoco station we stopped at.. 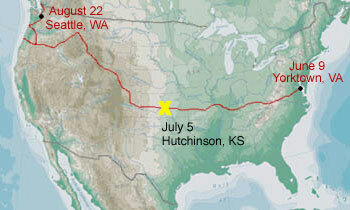 The spoke held for the 40 mile ride to Hutchinson. Now I'm a believer in these kevlar spokes. Everyone should carry one just for the unfortunate instance when a rear cassette side spoke breaks. Here's a picture of Joe riding down US 54. There are a lot of grain elevators here in Hutchinson. Off in the distance you can see them lined up along the railyard on the south side of town. Hutchinson is a great city. Some day I'll have to return to visit the Cosmosphere, a huge aerospace museum here in town. They are hosting the US Open Womens golf tournament right now here in town. Traffic is a little crazy and the restaurants are packed. We ate at an all you can eat mexican restaurant where we fueled up for tomorrow.